Thank you to everyone that attended the 2016 AgentLynx User Conference! We were overwhelmed by the response we received from our users and carrier partners. We closed out the week feeling inspired and motivated for the future, and we hope the same is true for you. There were some exciting announcements that we made at the conference, including our upcoming sales pipeline management tool EZLynx Sales Center, our Amazon Alexa integration, as well as various other details related to our plans for Communication Center, Client Center, and so much more. We’ve got 18 months until the next AgentLynx conference, so we’ve got a lot to do until then to make sure we deliver on everything we promised! We wrapped up the conference with Disco Night, featuring a live band, great food, and a great time with our customers and colleagues. We will update the AgentLynx website with a full gallery and overview of the conference in the next few weeks, but here’s a quick look. Who knew agents could dance so well! Are You Ready for AgentLynx? Have you ever wanted to connect with the people who are leading the industry in insurance technology? Later this fall you will have the opportunity to do just that! 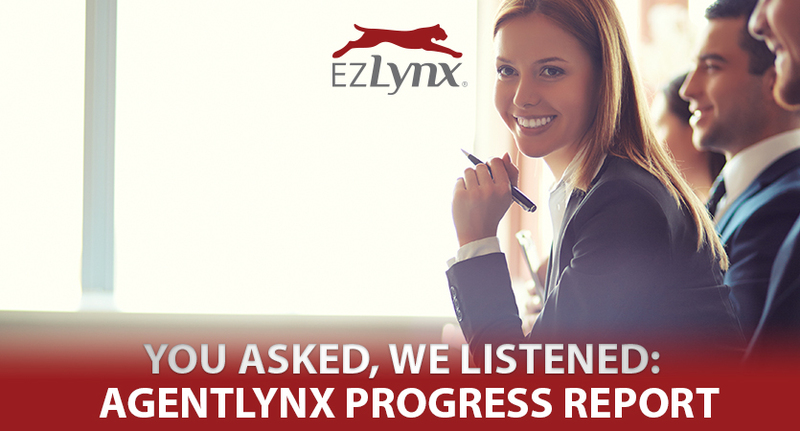 You will be able to meet and hear from the people behind the products at EZLynx during the Agent Lynx user conference. This is not a sales meeting! AgentLynx is a chance for EZLynx to help our users be more successful, showcase our current and future products, and to connect with our users on a deeper level. Conference attendees will have the option of attending up to 18 different sessions that will take place over the span of three days in Dallas, Texas. In addition to the various sessions, there will be a special Keynote speaker, networking opportunities, entertainment, and innovative swag to help you navigate the entire weekend. AgentLynx is the first annual user conference hosted by EZLynx and will take place in Dallas, Texas. The conference is three days only: Monday, October 10 – Wednesday, October 12. This conference will host a myriad of different sessions in various subjects from Policy Management to SEO and Digital Marketing Tips to Renewal Management. Attendees will benefit from an increased knowledge on the digital side of their agency, they’ll be able to walk away with insights on how to better manage renewals, and will be able to identify opportunity within their agency workflow. EZLynx welcomes both agents and carriers to this user conference. AgentLynx will take place from Monday, October 10 – Wednesday, October 12 at the Omni Mandalay Hotel located at 221 E. Las Colinas Blvd., in Irving, Texas. This location is only 10 miles away from Downtown Dallas. You can register as an agent or carrier online now at http://agentlynx.ezlynx.com/.